On June 28-29 Batken town, Kyrgyzstan, hosted festive events dedicated to the day “Isfara River is a river of friendship", which brought together representatives of the Small Basin Councils of Kyrgyzstan, Tajikistan and delegation from Uzbekistan, the representatives of the authorities, departments of water management, drinking water supply, public and international organizations, mass media. The event is traditionally held for the third year with the initiative of the Small basin councils of Tajik and Kyrgyz parts of Isfara River basin, and support of joint CAREC-USAID project Smart Waters. Within the event the sports football competitions, awarding of pupils – participants of contests for composing and drawing on the theme of cooperation, cultural workers concert of towns if Batken and Isfara took place. Also, Isfara Day hosted the International Practical Conference, which brought together members of the SBC, the representatives of international and non-governmental organizations, government executive officers. Information regarding the current work and plans of small basin councils for Isfara River was provided, the projects and programs, which are implemented in the Basin of Isfara River were considered. In this regard, the festive is an exemplary platform for a fruitful dialogue, friendship relations, peace-building and effective cooperation. Mr Muhammad Muhidinzoda, a representative of the Tajik delegation, Deputy Chairman of Isfara town, stressed that the establishment of the Tajik and Kyrgyz small basin councils of Isfara River enables dialogue between water and other stakeholders of neighbouring states for discussion of important issues of ensuring sustainable development of Isfara River basin. Isfara River water resources are used by the inhabitants of Kyrgyzstan, Tajikistan and Uzbekistan. First official participation of the representatives of the Uzbek delegation became a significant milestone for this event. 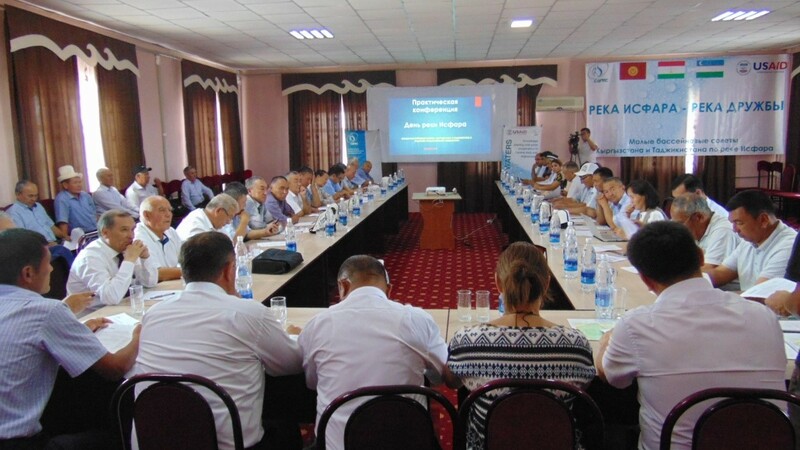 The Uzbek delegation was represented by regional and district water management departments from Besharyk district in Fergana oblast. As noted by Mr Sharofiddin Tulanov, a representative of the Uzbek delegation, head of Burbonlik water distribution division under Syrdarya-Sokh BAIS: "Water is people's wealth, a pledge of friendship and harmony. In case of any issues in water distribution, we address them together with our Kyrgyz colleagues for the equitable water supply in two countries". Next year Isfara day will be held in Tajikistan, in the town of Isfara. Isfara River was selected in 2012 as a pilot area within the framework of the "Fostering transboundary cooperation on small watersheds in Central Asia" project. Work in this area continues within the framework of the "Water, education and cooperation" project. Both projects focus on the development of transboundary cooperation and improvement of the social welfare of local residents through the implementation of the principles of integrated water resources management. Smart Waters project is implemented by CAREC with the financial support of the United States Agency for International Development USAID during the period 2015-2020. The overall objective of the project is to enhance regional cooperation on shared water resources. Specifically, Smart Waters addresses the knowledge dis-lock in the region in water sector, builds working relations among water managers and specialists, and demonstrates the potential of the basin management approach and cooperation with the academia.